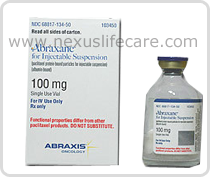 Abraxane Injection distributors, dealers & suppliers in Mumbai, India. Being a reckoned name in this domain, we are the leading manufacturer, wholesaler, trader, retailer and supplier of an excellent quality Abraxane Injection. The offered medicines are well processed with utmost care using finest quality of ingredients. Our medicines are thoroughly checked by our quality experts for assuring its precise formulation. Customers can avail these medicines from us at reasonable rates. Uses :- Abraxane Injection is used to treat metastatic breast carcinoma and can be used in the delivery of non-small cell lung cancer drugs. Side Effects :- Nausea, vomiting, diarrhea, mouth sores, headache, muscle, joint pain, numbness, tingling, burning of the hands, feet, weakness, or dizziness.